Marbella Club Golf Resort golf course in Malaga. Golf in Costa del Sol, Spain. 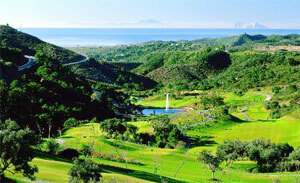 Marbella Club Golf Resort is situated in Benahavís, between Marbella and Estepona at the Costa del Sol. This prestigious Golf Club is an initiative of the owners of the famous Marbella Club Hotel and Hotel Puente Romano. Although there is a limited number of tee times reserved for visitors, playing here is normally only possible as a guest of the hotels or you need to own property on the spot. This fantastic 18-hole course designed by Dave Thomas and opened in 1995 runs though a rather hilly setting covered with pines and cork oaks, offering wonderful views over the Mediterranean Sea, Gibraltar, the Sierra mountains and African Coastline. Marbella Club Golf Resort also has superb equestrian facilities. The Golf Resort and the Equestrian Centre are located just 20 minutes from the five star hotels Marbella Club and Puente Roman in a beautiful natural environment. The course is for the exclusive use of guests of the Marbella Club and Puente Romano Hotels plus property owners in the Resort who have exclusive use of the course for morning tee times and preferential tee times in the afternoon. 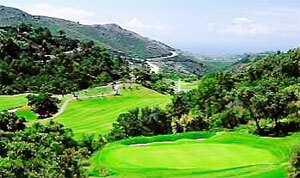 Address: Marbella Club Golf Resort, Carretera de Benahavis, km. 3,5 - 29679 Benahavis, Malaga. How to get there: The Marbella Club Golf Resort is located at the Costa del Sol behind Cancelada in the hills. From Malaga airport take the highway A-7 to Algeciras. Take the exit 172 to A-397/Ronda/San Pedro de Alcantara. On the national road N-340 to Algeciras take the turn-off signposted BENAHAVIS between San Pedro and Estepona. Continue for 3.7 kms on the inland road and take the left hand turning with a sign for Marbella Club Golf Resort.